Prime fishing, peaceful solitude, rock-slapping fast water, and scenic beauty are the attributes that recommend Big Piney Creek to outdoor enthusiasts. Though short by Ozark standards, just 67 miles, Piney has earned it's ranking as one of the best float streams in the state. 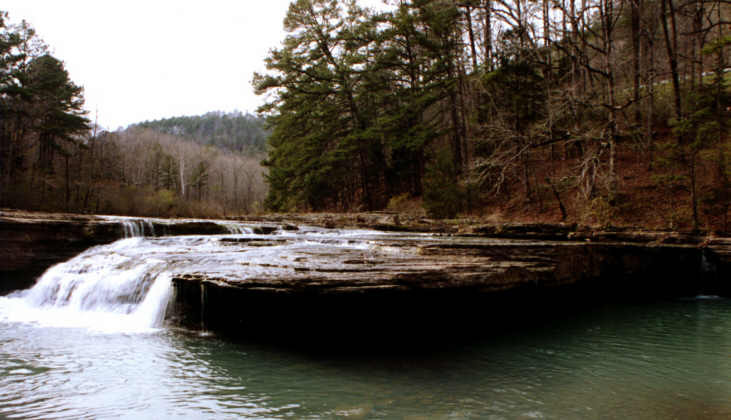 It begins in the heart of the Ozarks, among the rugged and remote mountains of southern Newton County and travels towards Lake Dardanelle in mighty dashes of whitewater interrupted by relatively quiet pools. Along the way there is fishing, swimming, hiking, hunting, camping, and floating along scenic bluffs and overhanging hardwoods. 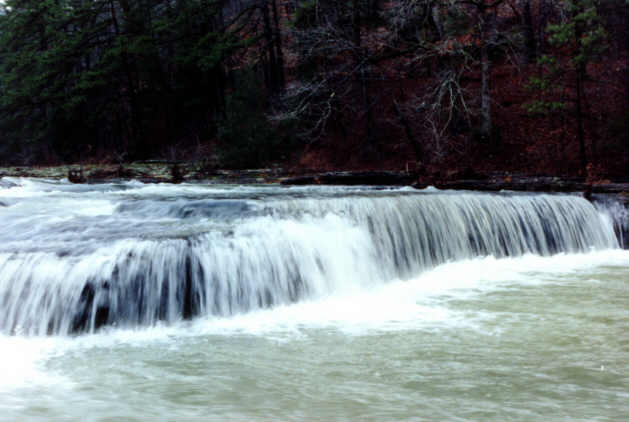 The uppermost stretch, from Limestone to Arkansas Highway 123 is not often floatable, but when conditions are right, this ten mile stretch of Piney has some rapids with a Class III rating. Watch for rainy seasons in early spring and late fall, but beware of camping along the river at those times as Piney can rise quickly. The next section is the eight miles from Arkansas 123 to Treat. Here, too, the scenery is great, but the valley is not so tight and the stream slows its pace a little. The rapids are Class I and Class II but the willow thickets that reach out and grab canoes can be a problem. The third stretch is from Treat to Long Pool and it deserves its reputation with white water enthusiasts. The hills crowd in again and the rapids have names like "Roller Coaster", "One Two Three Surprise", "Cascades of Extinction", "Surfing Hole", and "The Mother" on this ten mile stretch. This is definitely an expert class of water and, if you have time to look at the scenery, it may be at the occasional gravel bar where you have to stop for a salvage operation. From Long Pool to what is known as "Twin Bridges" or Arkansas 164, the Piney slows down considerably. This five mile stretch has longer pools and rapids are mostly Class I. It's a float you can take a novice along on and even those pesky willow thickets thin out. The final stretch from Arkansas 164 to Lake Dardanelle is a family float. You still get to enjoy the scenery and solitude of Piney, but there's no whitewater. Although the floating is at its prime from late fall until June, fishing is great year around if you don't mind wading and dragging your boat in drier weather. The cool clear water with its rocky cover is excellent smallmouth bass habitat and you'll also find largemouth, longear and green sunfish and rock bass. Anglers agree the biggest bass are most often taken in late fall and winter, although it's a time when there are few visitors to Piney. Campers like night fishing for catfish as well. The river's stretches of long pools are favorite swimming holes all summer through and camping is permitted almost anywhere on the Forest lands. Camping on gravel bars is not recommended because of the possibility of rains upstream causing a sudden river rise. There is one developed campground at Long Pool where 40 spaces are available for tents or RV's. Electricity and water are available and flush toilets & hot showers. Maximum stay is 14 days and the rate is $7 per day. The campground is seasonal and is open from March to November. To reach the campground take Highway 7 north from Dover 4.9 miles and turn left on Rt. 154. Go 3.6 miles and turn right on Road 1801. Go 2.8 miles and bear left on Rd. 1804 and go another 2.1 miles to the campground. For trail riders there is a horse camp at Moccasin Gap, 15 miles north of Dover on Highway 7. Haw Creek Falls Recreation Area, Camping trailers are allowed but no special facilities are available. Camping - 9 family units vault Toilets $4/site/day year round. From Hagarville, take Arkansas 123 north for 14 miles. 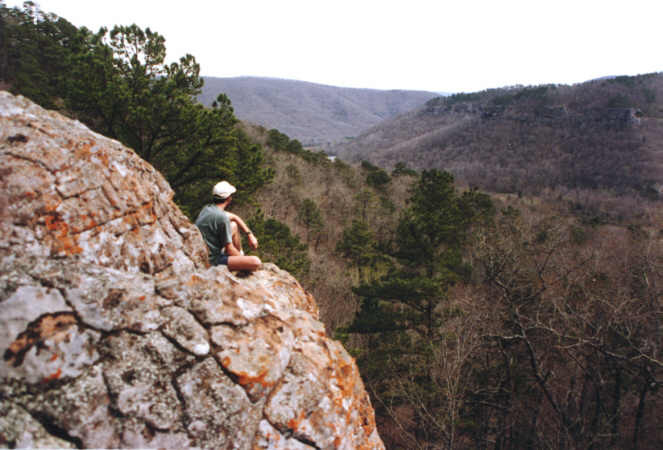 From Pelsor, take Arkansas 123 west for 12 miles. There is an accessible trail to the Haw Creek Falls. In winter, Piney is a favorite with hikers who want to get outdoors in an area of scenic beauty, watchable wildlife and solitude. The most often used area is the 15,000 acre Hurricane Creek Wilderness northeast of the Highway 123 bridge. While Piney doesn't have the massive bluffs for which the Buffalo is famous, there is a lot of scenic beauty to enjoy. An assortment of rocks as big as houses have tumbled down into the stream in places and the steep hillsides covered with a mixed hardwood and pine forest offer shelter to deer, wild turkey and even black bears. While Piney is generally known as a remote stream, access is actually very good. At Limestone, the stream can be reached on Forest Service Road 1004. Arkansas 123 and Forest Road 1802 provide other access points. The most popular beginning point is at Treat on Forest Service Road 1805. A local landowner will allow canoeists to put on there for a nominal fee. Access is also available at Long Pool and Arkansas 164. Canoes and shuttle service are available locally and supplies can be obtained in Dover or Russellville. Information on river levels for floaters is available by calling the Corps of Engineers at 501-324-5150. Best floating is in the 3.0-5.0 range.